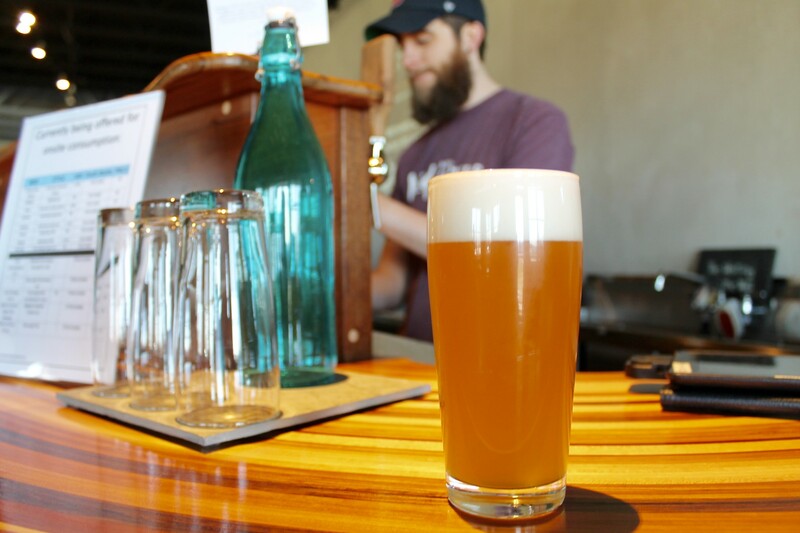 Stonecutter’s libations have been years in the making. Barrels of spirits sit in waiting as their gin predecessors are served in the front tasting room. This is where we sit, learning about the strategic, and practically poetic, art of aging Stonecutter Spirits. Co-founder Sas Stewart serves up our first taste. Staring at the large barrels in the back room, she explains the process of aging Stonecutter’s gin in reclaimed oak bourbon barrels. 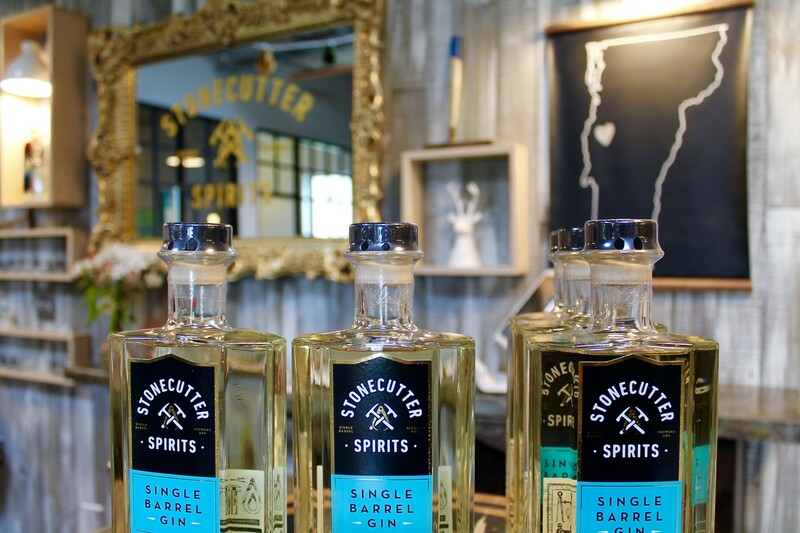 Compared to other Vermont standouts, such as Barr Hill’s Tom Cat and Silo’s Reserve Gin, Stonecutter’s single barrel gin is delicate in terms of both hue and flavor. While we initially assume the light color is due to a shorter aging time, we stand corrected. Sas explains that the gin has been patiently aging in its bourbon barrel for four months prior to its bottling and move up to the tasting room. The former oak barrels, in fact, contribute to their gin’s significantly lighter profile. This lightness also allows for delicate botanicals to shine through. 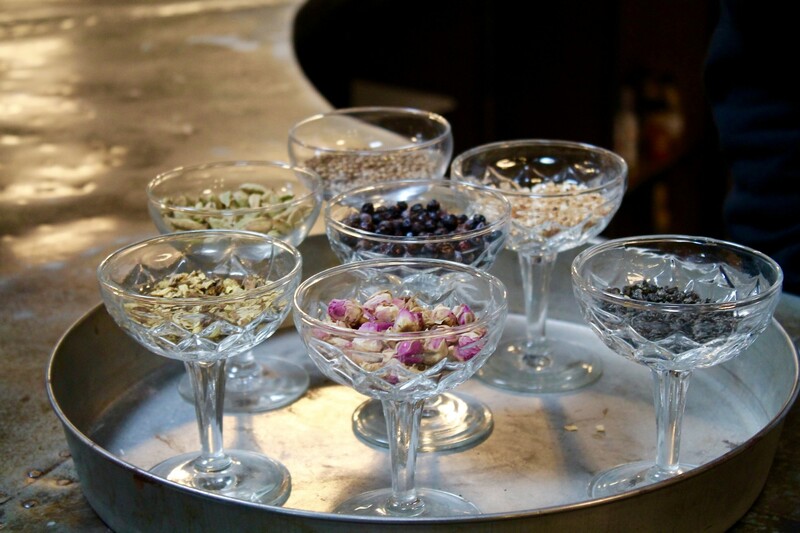 These include the likes of juniper, cardamom, licorice, orange peel, coriander, and rose petals, all ingredients placed in coupe glasses for a tangible display of the various gin components. Sas and fellow co-founder, Sivan Cotel, take special care in sourcing their ingredients, ensuring each botanical used is the best available. Stonecutter sources its juniper, for instance, from Albania – a region known for this particular ingredient, thus enhancing the core botanical used for gin. Another sip has us reveling in the unique harmony of these ingredients. 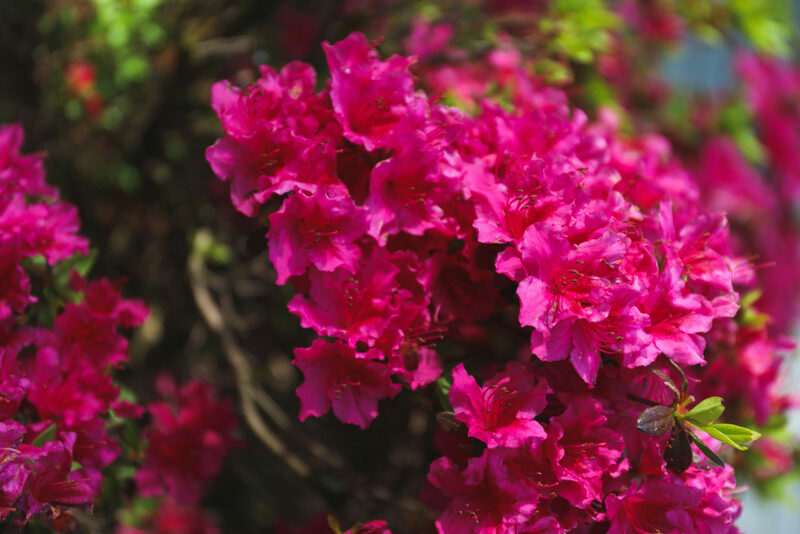 Truly a science, each botanical is added on a meticulous gram level. We continue to sip on the samplings, even more in tune to the logistics that have gone into this libation. Slowly, we notice the incredibly complex flavors that are distinctly soft at the same time, making for a smooth taste through-and-through. “Gin and whiskey. Those are my favorite spirits,” Sas proclaims. With this in mind, Sas and Sivan sought to create a gin for whiskey lovers, along with a whiskey for gin lovers. In essence, Stonecutter wants you to take a chance. Don’t consider yourself a gin lover? Just try it. Sas is incredibly proud of Stonecutter’s unique recipe that proclaimed gin-cynics actually love. Stonecutter’s small batch whiskey will soon accompany their single barrel gin. In keeping with their innovative aging methods, Sas and Sivan are finishing the spirit in specially curated cabernet barrels. This will add yet another nuanced layer. 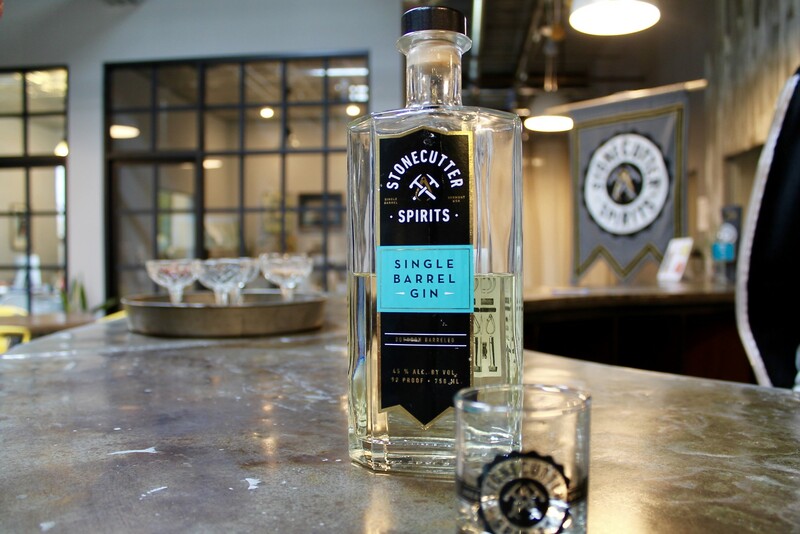 Requiring a longer aging time than its gin counterpart, Stonecutter’s whiskey is “distilled like a bourbon, aged like an Irish whiskey, and finished like a Scotch.” Its three-barrel aging process involves former bourbon barrels before continuing in fresh, once-used bourbon barrels. After at least four years, Stonecutter lets the whiskey bask and finish in red wine barrels. Sticking to Stonecutter’s New England roots, the availability of both their gin and whiskey will remain local to Vermont at this time. Rows of barrels line the expansive warehouse behind Stonecutter’s tasting room. With plenty of space for the company’s foreseeable growth, Stonecutter has clearance for a beautifully unique event area, as well as extra room to store barrels for friends and colleagues – now that is the community spirit we love to see! 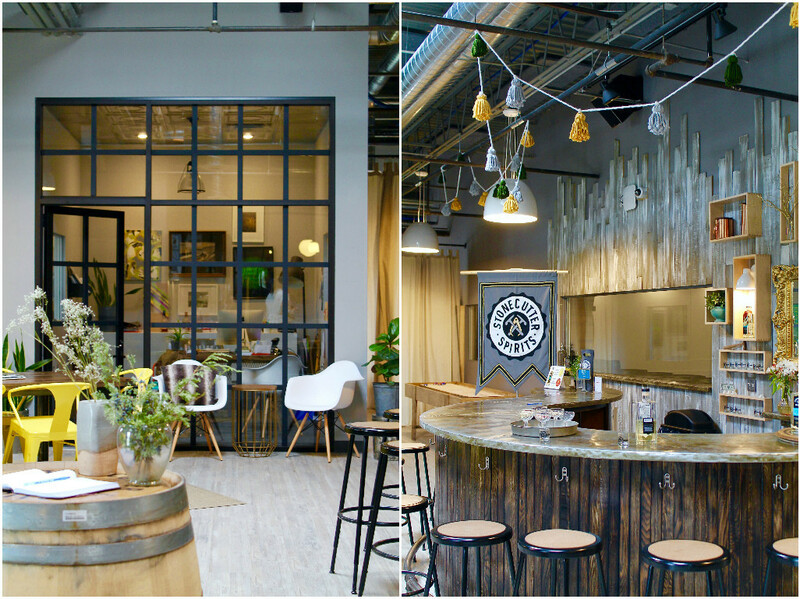 Beyond the windows looking into the warehouse, Stonecutter’s tasting room creates a strong voice for Sas and Sivan’s brand from the moment you enter. 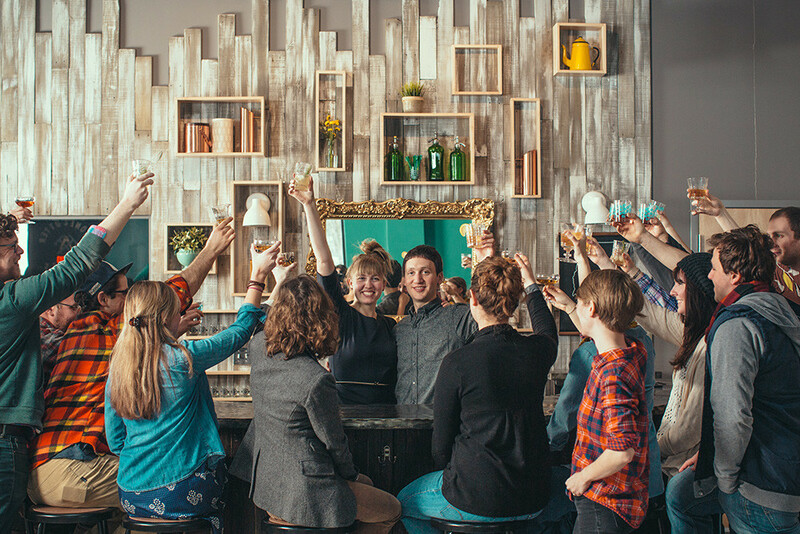 Sas played a major role in decorating the space, which provides a creative atmosphere to sit and mingle while sipping on a well executed cocktail – a delicious way to showcase the properly aged gin. Sas shows off her mad mixology skills behind the tasting room’s ever-changing cocktail menu, and welcomes us to taste a couple of her experimental mixtures in the Stonecutter test kitchen. As avid cocktail lovers ourselves, we are always in pursuit of a well made recipe. And recipes, Sas has in abundance. Whipping out her (almost complete) journal of cocktail brainstorms, we notice the multiple arrows and cross-outs evidencing the methodology Sas puts into preparing each drink. We turn, wide-eyed and fully inspired, to admire the rows of homemade simple syrups lining the kitchen shelves. Following in the upcoming tiki theme, Sas serves up an experimental concoction of chili-pineapple syrup, grapefruit juice, and gin – undoubtedly a fantastic start to a delicious cocktail. Sas continues to share her recipes throughout Vermont, having acted as a guest mixologist at reputable restaurants such as Hen of the Wood and Misery Loves Company. Be sure to follow Stonecutter’s social media accounts to stay up to date on future bar takeovers. Sas and Sivan’s single barrel gin has received some well-deserved accolades as of late. They’ve won Double Gold (denoting a unanimous decision) and Best in Category at the 2016 San Francisco World Spirits Competition. Stonecutter Spirits has gained respected validation for the careful thought that went into their handcrafted gin. Industry affirmation speaks to Sas’ “aha!” moment, coupled with her very first taste of Stonecutter’s ripely aged gin. She remembers this initial sip fondly – a moment in which she knew Stonecutter had something truly special. And this first product has undoubtedly hit a grand slam with its customers and judges. 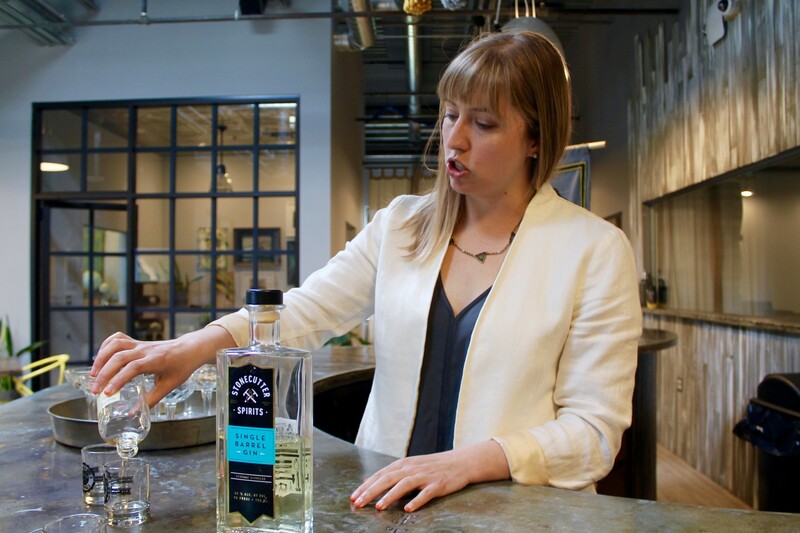 Sas and Sivan follow their guiding principle that “aging is just as important as the libation’s botanical profile.” Stonecutter Spirits has certainly perfected the execution of both. Thank you, Sas and Sivan, for touring us around your facility and sharing your tasty spirits. 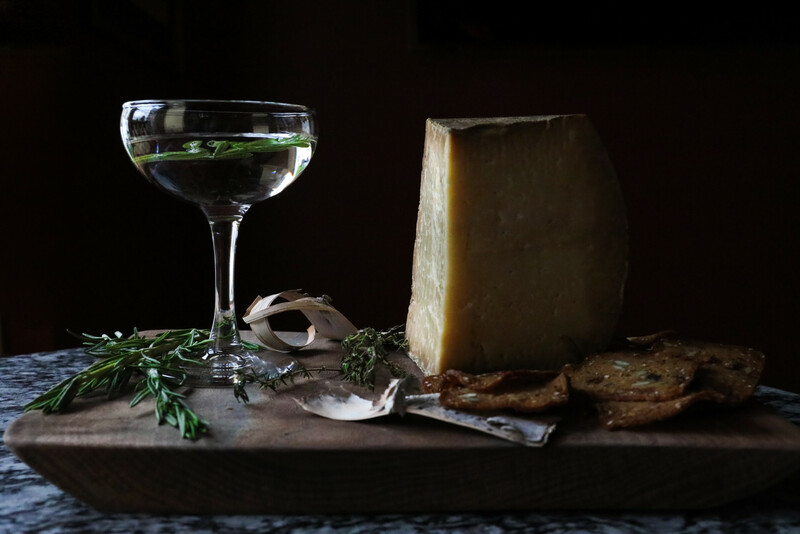 Be on the lookout for a special Cheddar & Gin cocktail recipe to come! 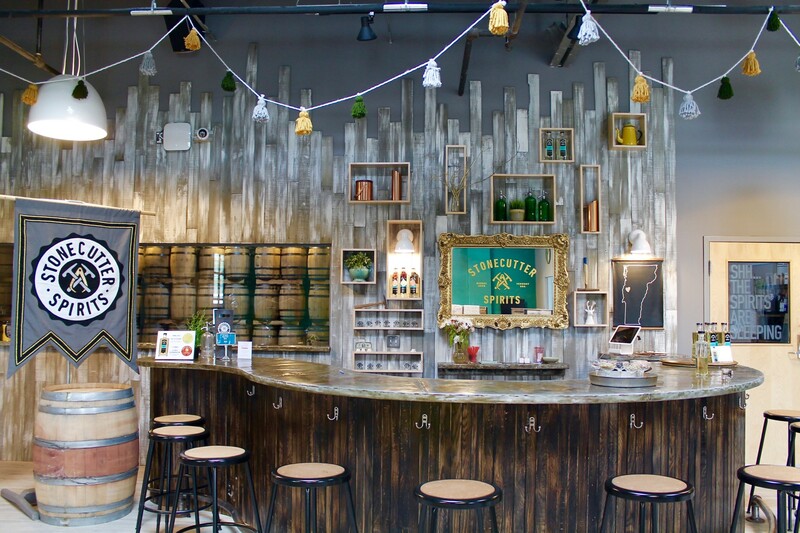 Visit Stonecutter Spirits in Middlebury! Enjoy tastings, bottle sales, and cocktails Thursdays 12-8PM, as well as Fridays and Saturdays 12-6PM. Interested in knowing about the most up-to-date Stonecutter events? Call, email, or follow their Instagram to engage in the full Stonecutter experience!